Learning to budget money is not always as easy as it seems to most people as it takes time and planning and continual revisions over the course of the year. Some people have no desire to budget monthly and only check in quarterly or yearly but not this guy. Most families are happy to start out with a basic budget sheet until they get the hang of the monthly budget items that they need and over time will graduate to something a bit better. In our case that is what we did and later designed our own CBB monthly family budget as an excel spending worksheet. In 2012 we learned alot about our spending habits and in 2013 we hope to challenge what we learned to make this year an even brighter year in terms of finance and savings. By April this year our mortgage should be closed and paid in full as this will be our 4th year into a 5 year term. We are currently in the process of getting this all sorted out so it’s a waiting game but one we are ready to celebrate when the time comes. Champagne anyone? You bet we are excited and why I want to tell you anything is possible. Budget spreadsheets in my opinion are simple to use because they do the work for you as long as you have the formulas set up properly. Problem with excel is that if you don’t know what you are doing it’s easy to mess up a formula and things simply won’t make sense anymore. That is why I added a basic budget sheet to my free downloadable money saving tools on the blog for those that aren’t so handy with excel and spreadsheets. I’m hoping once our new website is up I will start a resource page of all the free budget spreadsheets on the web for you. Our budget isn’t the only one around in fact there are thousands of them and you need to pick the one that is right for you. If you have any you would like to submit for my resource page please feel free to email me as I’m starting to build this list now. Whether you work with a cash budget in jars or envelopes you still need to track your expenses. If you don’t know where the money is going it’s hard to make it work for you. Some of my fans prefer to make household binders where they add work sheets with monthly budget items and track them manually which is also fine especially if you aren’t computer savvy. You may have seen budget binders on the TV show Til Debt Do Us Part and Gail keeps it simple and so should you. Below are the links to my budgeting series which I wrote along the way while designing our spreadsheet. Honestly I’m not a financial planner/advisor per my disclaimer so I can’t tell you how but I can show you what we did and you can decide if that is right for you. The last thing I want to do is pretend I’m some sort of budgeting guru when in fact I’m just a regular guy just like everyone else, some might call me a budget nerd. I love seeing money grow and where it has gone and I hope you do to. 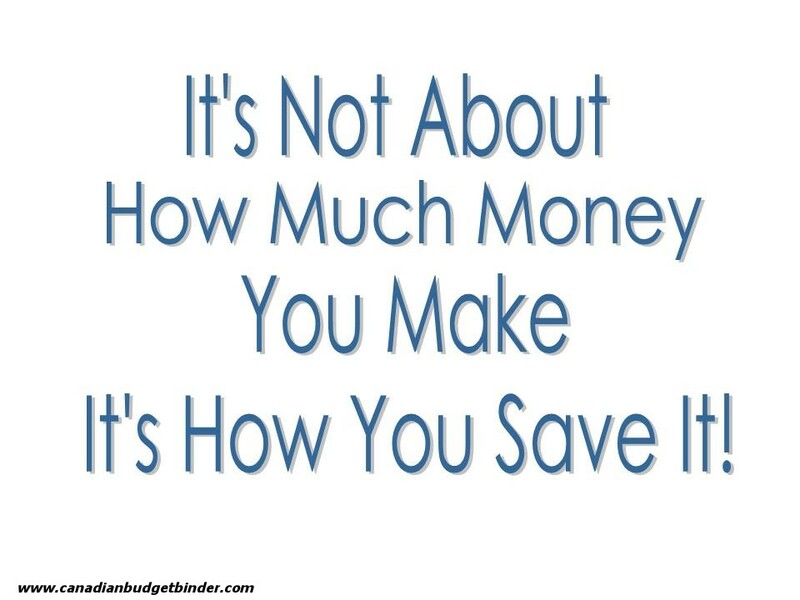 Only you know your finances and have to make informed decisions about what to do with it. Please take the time to read through the budgeting series and I hope you take something away from the information as part of your household budget guide so you too can track how your money is spent. In December I highlighted all the changes to our budget which you can read in the link just above what I am writing here in my success formula post. We also had a change in our vehicle insurance which was updated this month and we lowered our petrol amount and added a stockpile category. So far so good but we will continue to monitor everything. This adds up to 81.14% but it does not include our projected expenses because it’s not savings and it hasn’t been spent yet. Our goals is to save at least 50% of our net income each month and live from one income. Our savings of 44.37% includes savings and investments. We have 3 Canadian Bank Accounts with our Chequing account being with President’s Choice Financial. We chose PC Financial as one of our banks because we didn’t want to pay any bank fees. We also have never felt the need to see anyone personally inside of a bank but if we do Canadian Imperial Bank of Commerce (CIBC) will gladly help us out as PC is affiliated with CIBC. PE=Projected Expense is money which is automatically saved each month ready for when the bill comes in or for when you need it as in the example below. We go over our projected expenses at the beginning of the year to set up our yearly budget and adjust as we go along if a new projected expense arises and needs to be added to the budget. This has happened on many occasions but it’s bound to happen as we can’t predict everything we have to pay for over the course of the year. The important part for us is that we are saving for the expense and we no longer have to stress about taking money from our savings to pay for them. Example: Clothing we budget $10 per month. If we don’t spend it we move it to the projected expenses account. This means we should have $120 per year for clothing to spend. We have to track that expense as we spend it. Grocery- $235.00 Spent $206.95 Play The Grocery Game With us to Save! Overall: This has been a month of learning again as numbers changed since 2012 and we want to narrow down our expenses so we make sure we are saving enough in our projected expenses account. Our water softener was put to rest last night so we can expect a $1000 bill for a new one in February’s Budget Update. Poor thing was over 15 years old and did what it had to do but sprung a leak. I’ll do a blog post follow-up on the removal and installation of the new system soon. Check in at the beginning of March 2013 to see how we made out in February 2013! Question: Do you save for projected expenses, if not how do you pay for them when the bill comes due? That is simply awesome, Mr. CBB. I always feel so inspired by your updates. Thank you for the invaluable resources, such as the included budget sheet. I am still wrangling my way through Excel so that is super handy. You’re welcome Jennifer, if you need anything shoot me an email mate. Excellent work my friend…and congrats on almost having that house paid off! We should be there in about 2 years! We never would have been in this position if it wasn’t for learning how to budget. Thanks, as always, for sharing and being so detailed. I’m not quite that brave, but maybe I’ll get there if anyone in interested in seeing. Looking good…….. I’m looking forward to when you get that mortgage paid off!!!! !Sounds like the new site will be beyond awesome… can’t wait! Same here Christine, long time coming for us we’ll have a virtual mortgage burning party! Fab month, Mr. CBB. We have a mixed approach to projected expenses because we spend so much less than we make for our everyday costs. Bg money like IRA money ($10K) gets set aside every month as we usually buy in at one time during the year. But other just big-ish expenses are handled as they come up with the monthly income buffers. For example, the last year we paid down $38K worth of debt. While we were doing that we had to pay big-ish expenses as they came up for the duplex (taxes, insurance, etc), but it was better for us interest-rate wise to use the money beyond our buffer and retirement allocations for immediate debt paydown (since that was at 6%) rather than saving it in an account earning < 1%. It's a comfort level and knowing how big an expense has to be for us to really focus on setting stuff aside more than a month or two in advance. Ya I get what you mean, and really it is all about that comfort level. We just thought of everything that we would have to pay for at some point in time and added to the budget and turned the category into a projected expense. It has worked out fab for us. Our water softener went and broke down on us last night so now we will blow around $1200 for a new, thank goodness for that projected expense in home maintenance… Have a good one mate!! A great post and i can see how your budget is working very nicely for you! Also good to see your goals, the amount of people i speak with, who have not written their goals down frustrates me. I believe if you keep up the hard work you exceed your expectations. I added the goals this month to help motivate us as well all need something to strive for. thanks for reading. Great work Mr. CBB! It looks like you’re killing it, as usual, with the budget. I agree that budgeting is not as always as easy as some might communicate but that should not hold us back. I know I did allow it to years ago, but am so glad that we took the path of budgeting. I really view it as having a plan for our money and directing it to certain areas that’ll work best for us. There are so many tools available to get started and I always encourage people to find what works for you and go with it. Thanks John for sharing that and I agree that once one starts to budget they may see how much easier it is to live life with a budget rather than with-out.